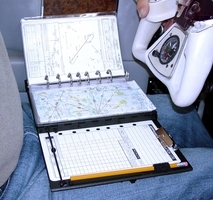 The ORGA-KNEE-ZER TM Model A1-MC (shown below), is an extremely versatile, pilot organizer kneeboard providing a standard 7-ring binder on a very stable platform with an independent writing surface and many other unique features. Use for VFR or IFR flight, using NOS or Jeppesen charts and see how it can adapt to your demanding and varied needs as pilot. Named one of the "10 Coolest Cockpit Gadgets" by Plane and Pilot Magazine, detailed in Flying Magazine and highlighted in AOPA's Flight Training Magazine (see "News Room") ... yes, it is very cool! The patented design, allows you to flip through your charts, checklists or other reference materials, without blocking your writing surface for jotting ATC instructions or holding flight plans. The curved and padded base provides an extremely stable platform, and includes a built-in pencil sharpener and combo mag-lite/pencil holder. Compact stowage, rugged materials and powder coat finish, add even more to the rich feature set. Check out our great reviews under "Customer Comments"
All Rights Reserved © 2002-2016 Scott Wings, Inc.
Scott Wings, Inc. is doing business in the United States of America.